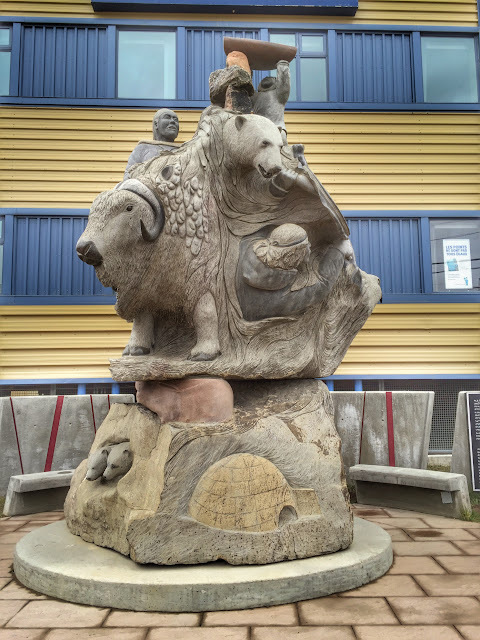 Seeking True North, Day 14: Iqaluit, NU. 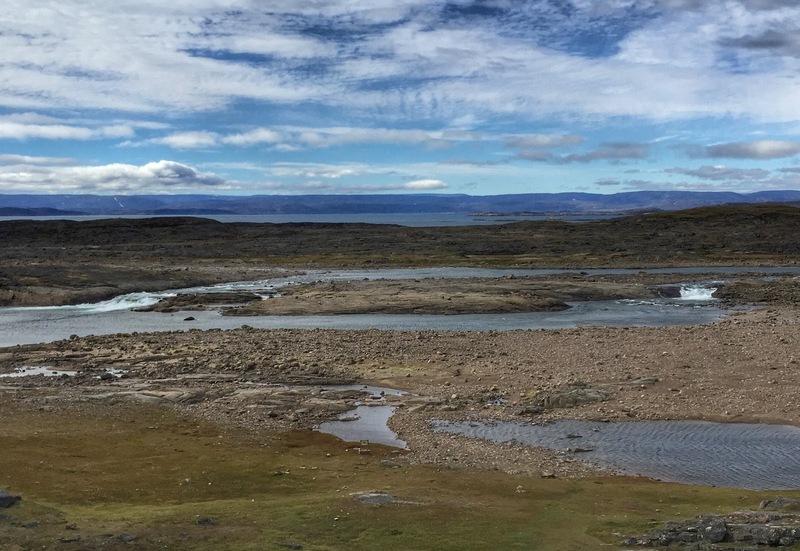 When we left our hotel this morning, we were stunned to see a large expanse of brilliant blue sky—the first we've seen since arriving in Nunavut. See the yellow submarine? The big marshmallow? The igloo church? We've noticed that with the buildings so colorful and architecturally unique (and no trees to block your view), you can, after just a couple of days, identify buildings from across town—the yellow submarine airport, the puffy marshmallow elementary school, the igloo church. In the compact town, it certainly makes finding your way around easier. Shh! Don't tell anyone but there's a letterbox hidden somewhere in this picture. Our first stop was the Apex beach, where we wanted to plant one of our Nunavut letterboxes. Even the beach looked different today under blue sky. 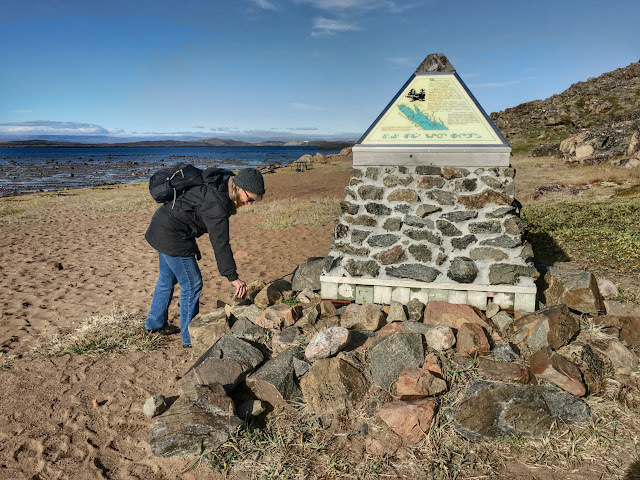 The trailhead sign for the beach path to Iqaluit provided the perfect hiding place. The wind was quite brisk and made for a bracing walk on the beach. 3 bedrooms and 2 baths in less than 1,600 square feet...What a price tag! 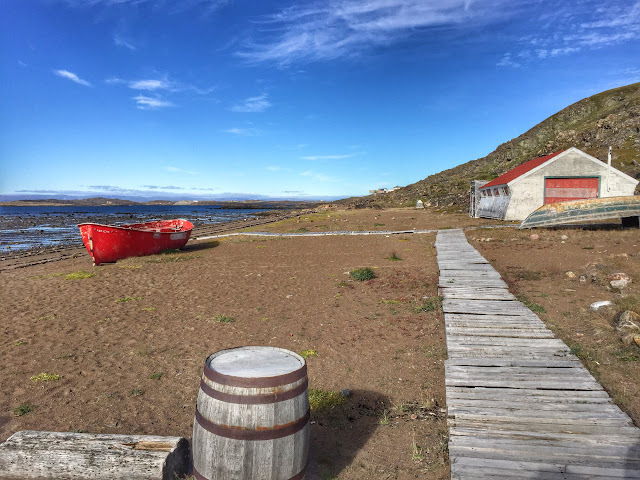 Back in Iqaluit, we passed several houses with For Sale signs. With all we have heard about the cost of living here, we decided to investigate the details on one of them. Even in a city where a single pack of cigarettes costs in excess of $19.00, we were amazed. This 3 bedroom/2 bath house is 11 years old and has 1,576 square feet. Average monthly utility bills were included in the real estate ad: $150 electricity + $80 water/garbage + $340 heating oil. Ouch! Annual property tax is $2,800. Like many houses, there is a storage area under the house. 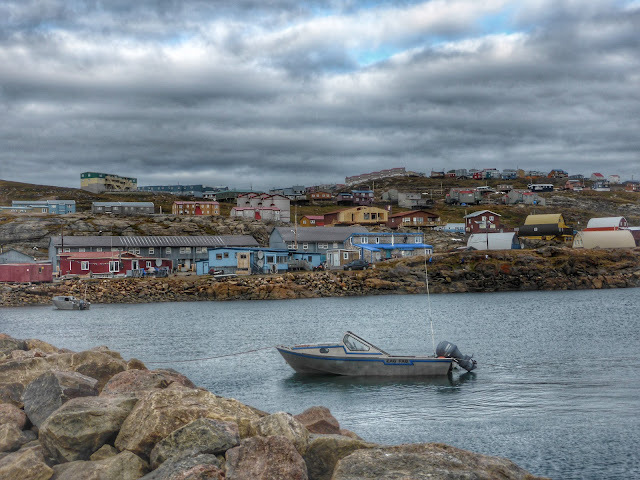 In Nunavut, one buys the house only. 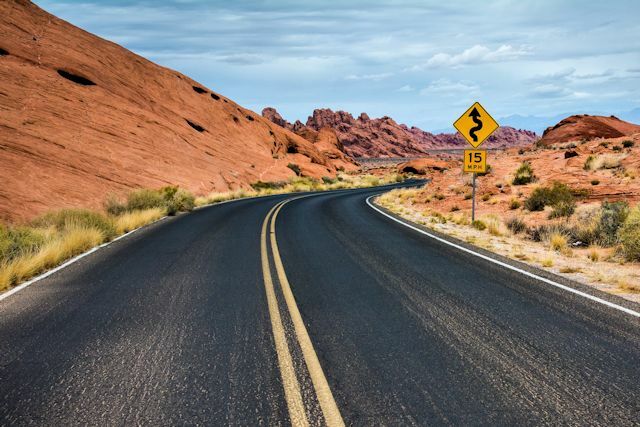 The land itself is jointly owned by the community, and homeowners pay a land lease. Price: $539,000. Back at Sylvia Grinnell Territorial Park, we planted a second letterbox to go with the one we had stashed there a couple of days ago. This one is near what is affectionately called the waterfall on Sylvia Grinnell River. One can imagine a much larger cascade earlier in the summer when snow melts, but today it was pretty tame. 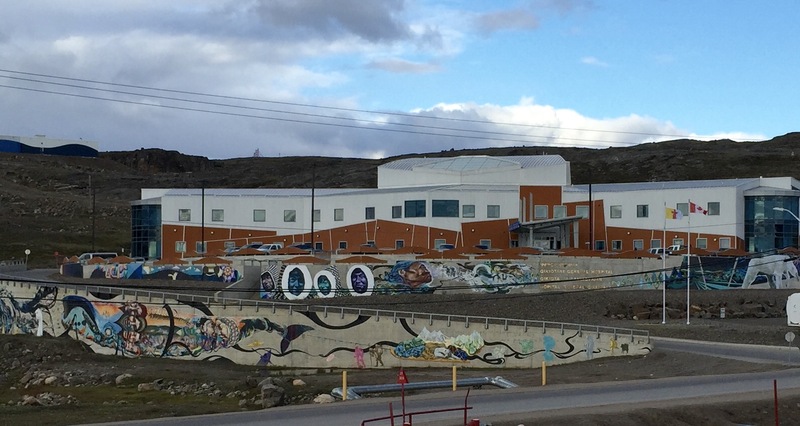 After lunch at our hotel, it was time for us to catch the 1:30 tour at Nunavut's Legislative Assembly Building (the Ledge). We arrived just before the tour began. Along for the experience were Martin and Jenny, in from Winnipeg to visit their son and daughter-in-law, and three friends from Yellowknife—Crystal, Ryan and Heidi—who had just finished hiking what they termed a great trail north of Iqaluit. When we entered the building, we couldn't help noticing the design of a bench mimicked a traditional Inuit sled. Called a qamutiq (COM-eh-tik), the sled is built to travel on snow and ice, especially adapted to Arctic sea ice environment. 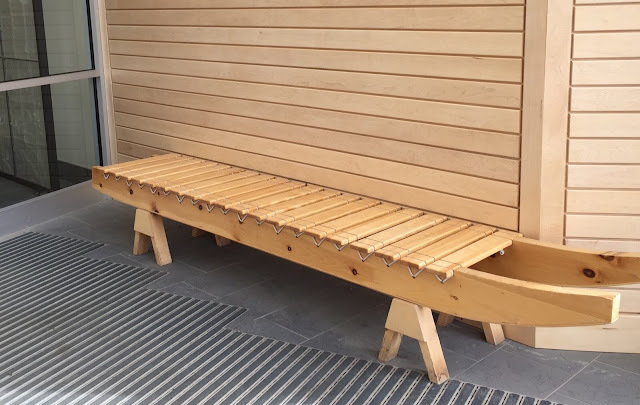 The key to this special design is the use of lashes to hold runners and crosspieces together, rather than nails or pins. This allows some flexibility in the qamutiq as it runs over uneven surfaces. In the old days, these sleds were pulled by dog teams or humans, today more likely by a skidoo (snowmobile). 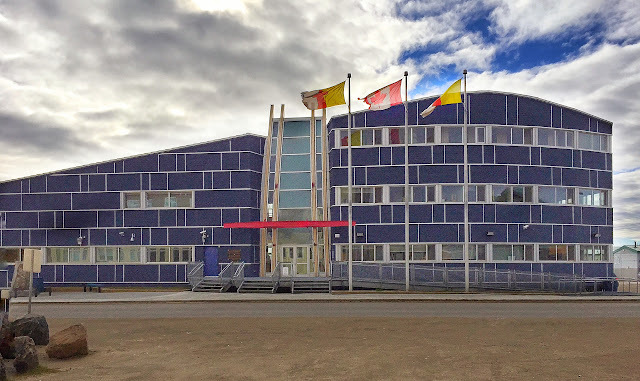 A vital part of Inuit culture, the qamutiq shape is also referenced on the front of the Ledge building. Alex was a lively guide, full of anecdotes and the kind of "insider" information that raises this kind of tour from mundane to memorable. 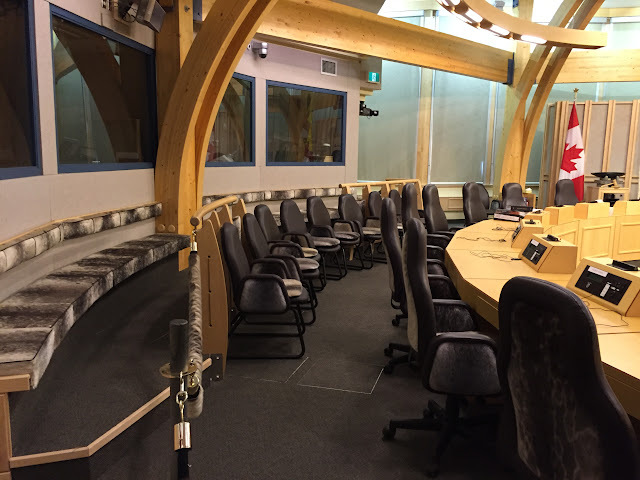 He took care to point out the symbols of Inuit culture incorporated in the legislative chamber and to distinguish elements that make it unique. The most atypical feature of the chamber—setting it apart from any other Canadian Ledge—is the special seating reserved for Inuit elders. Among the Inuit, elders are older members of the community who are considered culture-bearers. 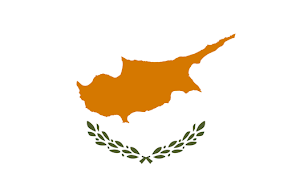 The distinction is not simply a matter of chronological age, but a function of the respect accorded to individuals in each community who exemplify the values and lifestyles of the local culture. In meetings of the legislative assembly, special chairs between the desk seats of the members and the public gallery seats behind them accord elders a special level of respect. They have no vote or say in the proceedings though they may be consulted. Like the maces of other territories, all materials used in the Nunavut mace come from the territory itself. 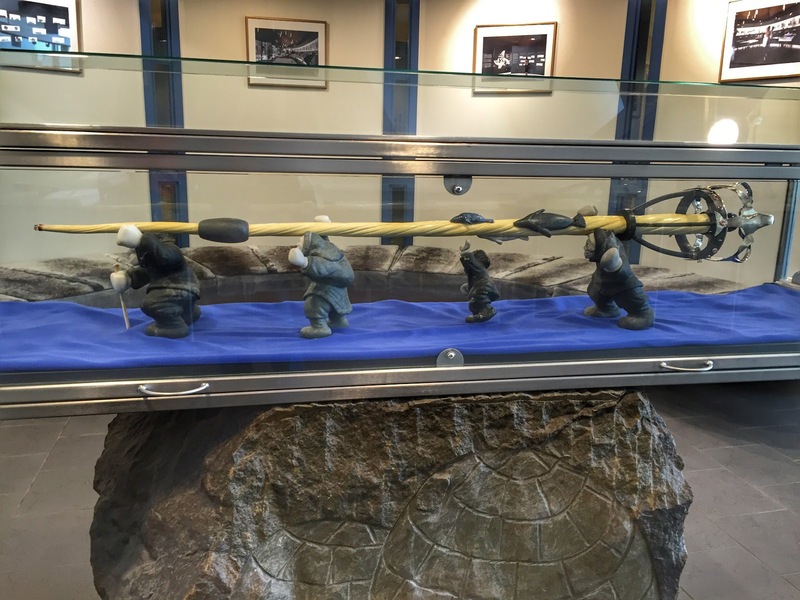 The ceremonial mace for Nunavut was created by local artists using local materials including a narwhal tusk and metals and gemstones from the territory. Blue lapis lazuli from an area near the village of Kimmirut is a special feature. According to Alex, this rare gemstone is found in only three places in the world. At the end of the tour, Alex suggested that we might enjoy a tour of the Nunavut Justice Center, knowing a group of government building aficionados when he saw one. Having passed by it numerous times, we decided to follow his suggestion, though we didn't see any of our fellow visitors from the Ledge there. Unlike the Ledge, which had only an indifferent security guard posted at a desk in the lobby, the courthouse conducted an airport style security screening. There was no official tour guide at the courthouse, so Deputy Murray, who works security, volunteered to take us around. 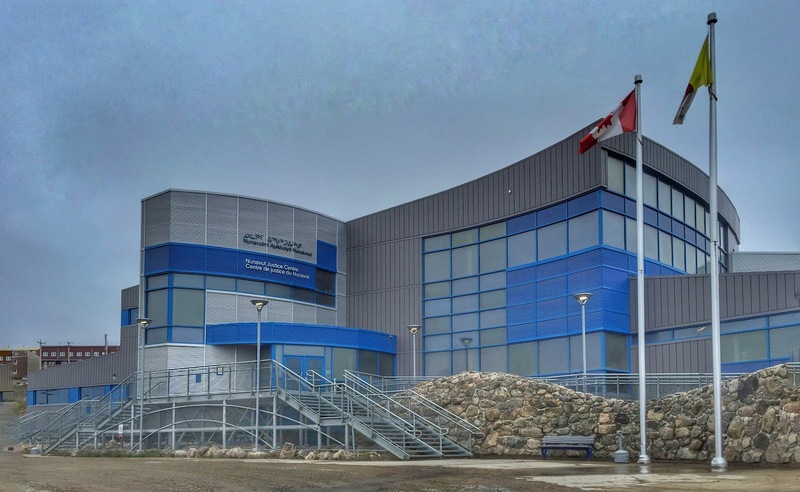 Nunavut's Court of Justice functions as both local and territorial court, Canada's only single-level court in a province or territory. 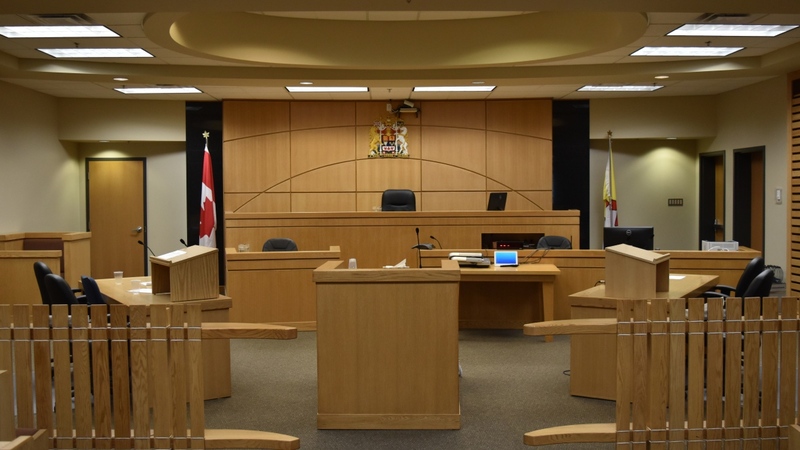 Its judges hear all matters assigned to both lower and provincial courts. Note again the presence of the qamutiq symbol in the partition between the spectators and the court. 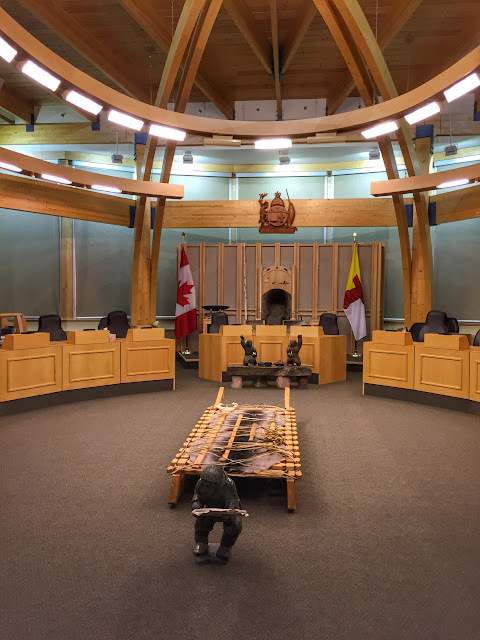 Inuit elders offered suggestions for the design and arrangement of the courtroom. On their advice, the witness stand (center front in photo above) was placed so that the witness is facing the judge and jury. The hope was that the person testifying would be more likely to tell the truth if he or she was looking these court officials in the eye. We also thought it might make the witness less susceptible to influence from any spectators. Now we wonder why all courtrooms don't have this arrangement. While at the courthouse, we sat in briefly on a criminal hearing that was underway in a smaller courtroom. A young man had been charged with vandalism. He was in the courtroom along with the court officials and the lawyer for the prosecution. Though we could hear his attorney participating fully in the hearing, she was not physically present. When we had an opportunity to ask Deputy Murray, he told us that because transportation is so expensive to fly lawyers or witnesses in from distant villages, they often participate in court hearings via audio or video. We wound up the day with one more visit to the Kickin' Caribou Pub, where we saw Vancouver Tom again but he wasn't our waiter tonight. After a light meal, we returned to the hotel to pack up for our return to Ottawa tomorrow. An overnight near the airport, and we'll return home on Wednesday. No one we asked knew what this new building is for. 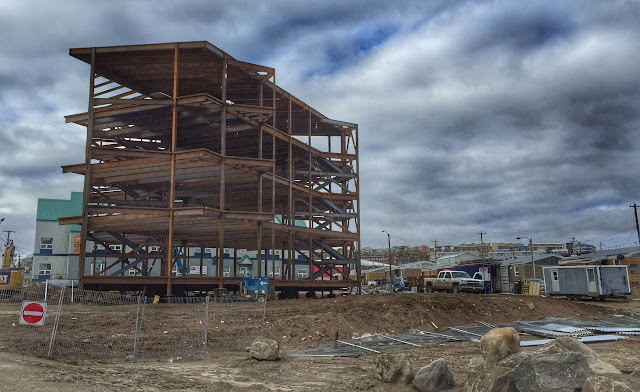 With a shipment of materials from the sealift, construction was active. 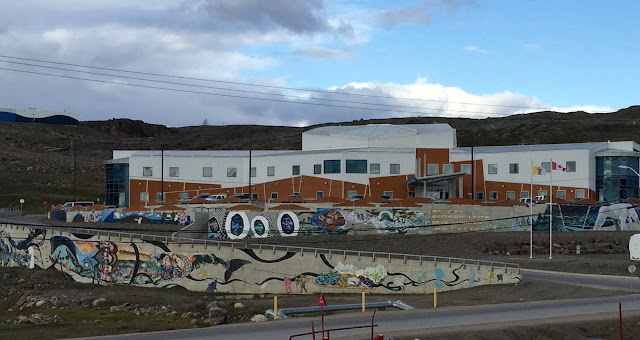 A joint effort by several Nunavut artists for the 20th anniversary of the Nunavut Land Claim. More artist collaboration on these beautiful murals at the local hospital. 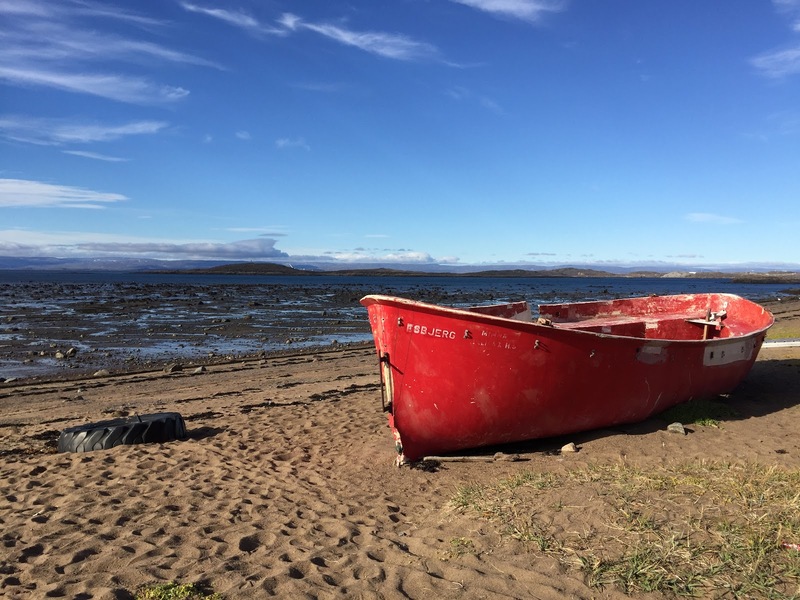 The so-called 'big red boat' at Apex beach. The big red boat again. It just keeps coming back. 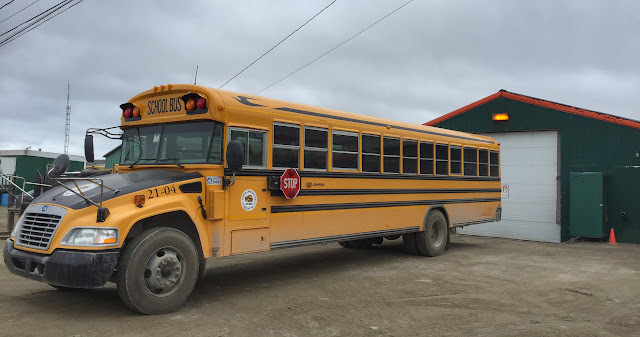 All the way from Fort Valley, Georgia (south of Macon) to the Arctic—a Blue Bird school bus! Iqaluit's first four-way stop intersection, known locally as the Four Corners, in the midst of its 5:00 "rush minute."